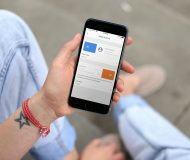 Interested in making a digital media purchase on your iPhone? The iTunes Store app is your primary portal for doing so. The iTunes Store app is a stock application that is installed by default on every iOS device. It allows you to make digital media purchases for a variety of media types. The iTunes Store app works in tandem with the stock Music app and the stock Videos app to provide users with a rich digital media experience. Check inside for details covering the ins and outs of this long running stock application. What is the iTunes Store? The iTunes Store is the main digital store where iOS users can purchase music, TV shows, movies, ringtones, and audiobooks. 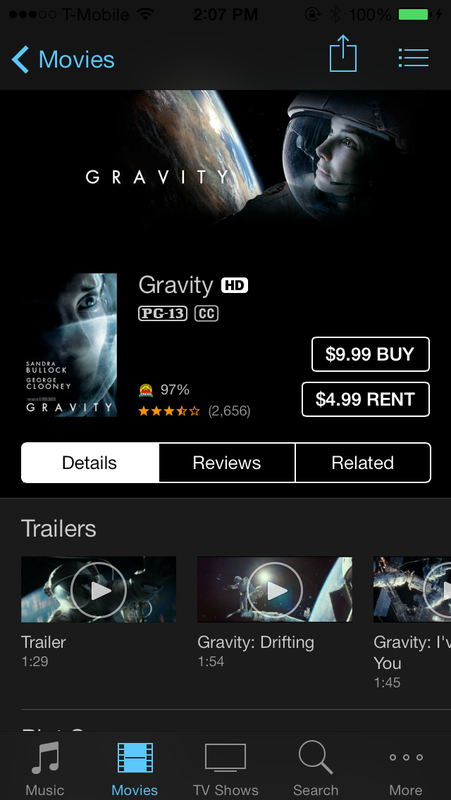 Movies can be rented from the iTunes store as well. 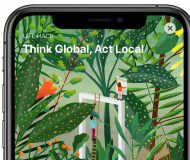 Users can search, access and download previously purchased content, and take advantage of Apple’s Genius algorithm to find new content based on similar types of media. The iTunes Store is jam-packed with all sorts of goodies, and regardless of your taste, you’re bound to find some sort of entertainment that you’ll find valuable. 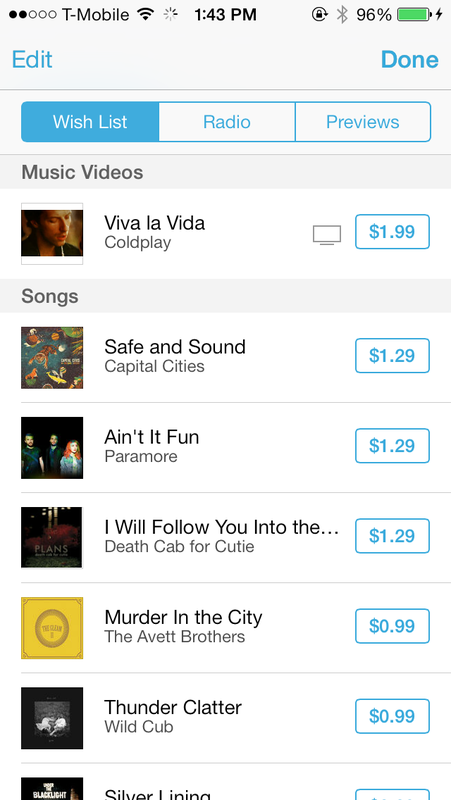 Upon launching the iTunes Store app, you’ll notice three main sections: top, middle and bottom. The top of the interface contains buttons for genres, featured items, charts, and Wish List. The middle of the interface contains all of the actual content available, which includes things like artwork, preview buttons, purchase buttons, and the like. The bottom of the interface features five media tabs, four of which are editable to meet your specific needs. 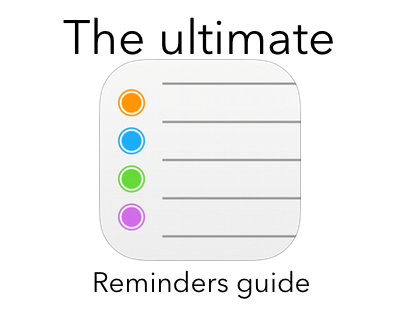 We’ll speak about each of the individual tabs in a later section of this guide. 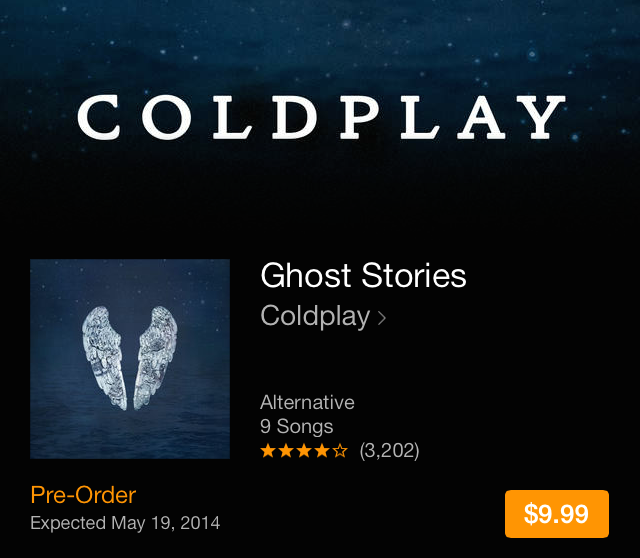 For now, let’s talk about previewing the content available to you in the iTunes Store. The middle of the interface, as mentioned, contains all of the content awaiting your consumption. Each media tab in the iTunes Store app contains a Featured button, which acts a hot-bed for new releases, specials, and popular items. Next to the Featured button lies the Charts button. Charts, which is also available in each of the other main media tabs, is a spot for highlighting all of the current chart-toppers. For example, inside of the Music tab’s Charts section, you’ll find top songs, albums, and music videos. To preview content inside any of the main media tabs, simply tap on the artwork associated with that content. If you tap on the album artwork associated with an individual song, the song preview will begin playing immediately. Generally speaking, song previews are about 90 seconds in length, a generous provision that debuted back in 2010. For movies and TV shows, you’ll find trailers that you can watch instead of the audio-based previews presented in the Music media tab. For Audiobooks, you’ll find a a 90 second audible preview, but it’s presented in a style that’s slightly different from the traditional song. Ringtone preview lengths are, of course, shorter, since ringtones are less lengthy than a full song. We’ll get deeper into the nuances of each media tab in the tabs section later on in this tutorial. Just keep in mind that virtually all content available within the iTunes Store can be previewed to some degree. This helps to ensure that you will be satisfied with your purchase. Upper area – contains a link back to previous content, a Share button, and a Wish List button. Item details – artwork, name, author, star rating, purchase links, and other meta data details. Details/Songs tab – This tab is the most varied, and differs depending on the type of media involved. 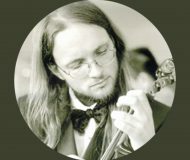 For Music and Tones, this tab is named Songs, and contains a listing of all songs included on any particular release. All other forms of media contain some sort of description or summary, perhaps trailers or teasers. You’ll find additional meta details media items such as Studio, Genre, Release date, Run Time, Size, Format, Network, Notes, etc. For video based content, the bottom of the Details section contains a link to switch between SD and HD quality videos. 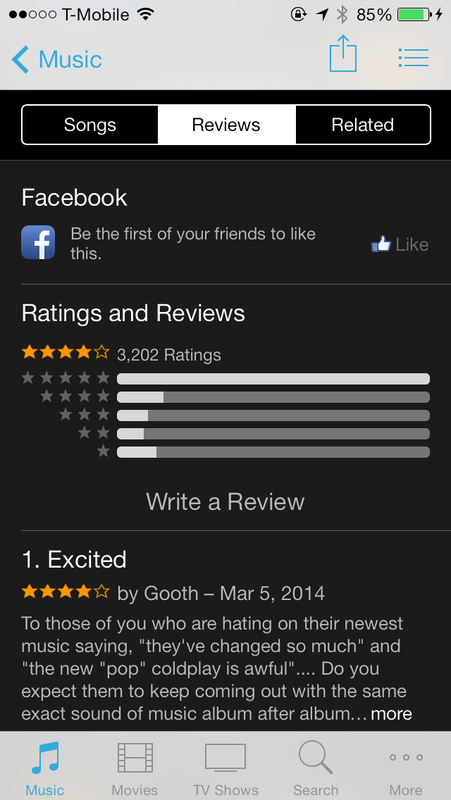 Reviews tab – The Reviews section is pretty much exactly the same as the Reviews section on the App Store. 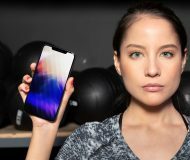 It features the ability to like an item via Facebook integration, write a star-based review or a detailed review, and read reviews left by others. 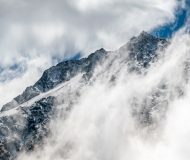 Related tab – Here you’ll find content related to the single item that you’re currently viewing. In the case of movies, you’ll find sequels, and other related films. In the case of Music, you might find other albums and singles featuring the same artist. You’ll even find cross media promoted items. For example, you might notice a movie or a music video when selecting related items for a particular album that you like. Speaking of purchases, let’s talk a bit about downloading content. Most of the content available on the iTunes Store is for sale. There are times when you can download items for free, but the primary method for acquiring content from the iTunes Store app is by purchasing, or, as with the case for some movies, renting. Before you’re able to download anything, you’ll need to ensure that you have an Apple ID logged into the iTunes & App Store section of the stock Settings app. The account must have a valid credit card associated with it before you can make any purchases. Once you have the Apple ID created and configured, you can begin making purchases on the iTunes Store. Tap the price box of an item, and you will immediately see the button change to ‘Buy’ in order to confirm your intentions. Tap the Buy button, and the purchase will initiate. 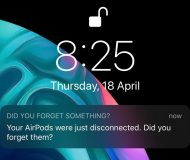 If you recently purchased content from the iTunes Store or the App Store, the purchase will complete without verifying your Apple ID password. If you fall outside of this grace period window, which is only a few minutes, you will need to verify your Apple ID password before the purchase is completed. Once the purchase is finished, it will go to your Downloads tab for immediate download. You can learn more about the Downloads tab of the iTunes Store app in a later portion of this tutorial. Once you’ve complete a download, the Buy button will change into a Play/Watch button. This Play button will link you to the respective app—Music or Videos—needed to play your content. Sharing items can be performed while in single item view. To learn more about single item view, see the previewing content section above. Tapping the share button in the upper right-hand corner of the iTunes Store app interface will present the iOS 7 universal share pane. From there, you can share links to all of your favorite iTunes Store content via the stock Messages app, Mail app, Twitter, or Facebook. You can also copy the link, Gift an item, or add an item to your Wish List. Items shared via the share button are displayed as links directly to the single item view in the iTunes Store. 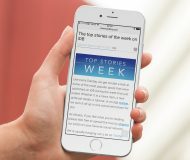 The shared links use the http://itunes.es/ short URL for easy identification. You can easily add items to your Wish List by means of the share button mentioned in the previous section. You can view your Wish List by tapping the Wish List button that resides in the upper right-hand corner of the iTunes Store interface. 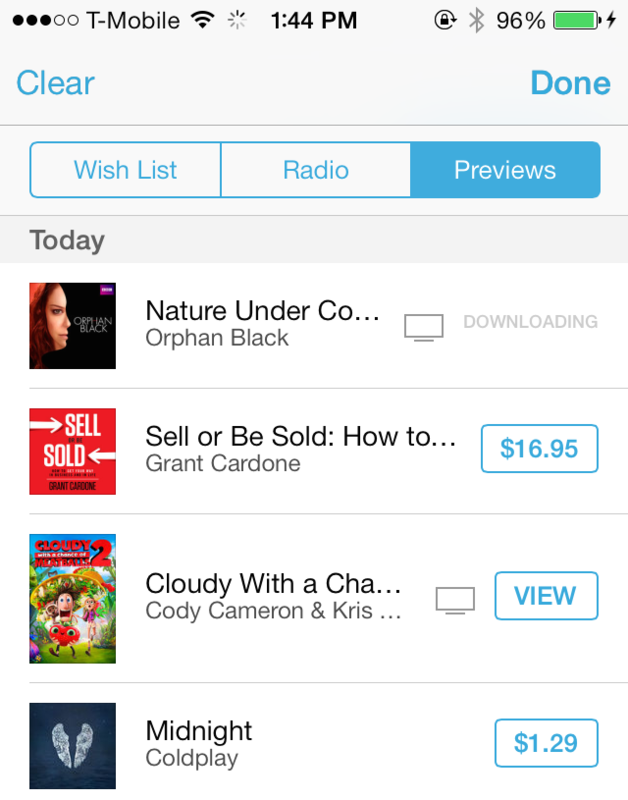 Unlike the Share button, the Wish List button is always accessible no matter where you are in the iTunes Store app. 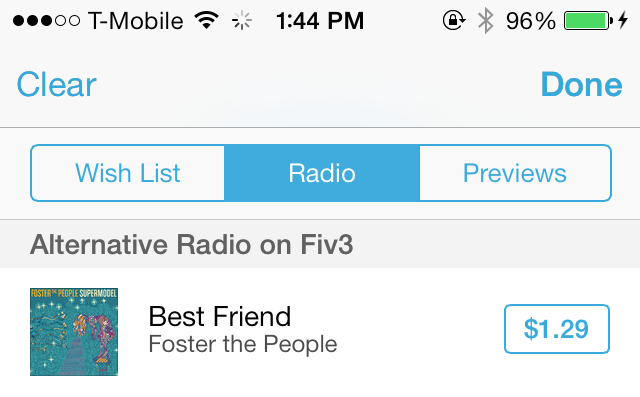 The Wish List button is actually comprised of three different sections—Wish List, Radio, and Previews. The Wish List section allows you to see any item added to your Wish List. From there, you can purchase items directly, or tap on them to go into their respective single item view. You can edit individual Wish List items by tapping the Edit button in the upper left-hand corner of the screen. You can then select individual items via the check box to the left of each item in order to prune entries. The Radio section allows you to see all of the songs you’ve listened to on iTunes Radio, along with buttons to buy the song, and artwork that links to its single item view. The Radio section displays radio plays from any device that you have linked to your Apple ID. You should see a heading to indicate which device a particular song played on. If you’d like to clear items from the Radio section, tap the Clear button in the upper left-hand corner of the screen. This clear button will clear all items from the Radio section in one fell swoop. The last section available when tapping the Wish List button is the Previews section. The Previews section contains a list of all of the Music, Tones, or Audiobooks you have previewed before. Like the other sections, you can directly buy previewed content from this view. If you’d like to clear items from the Previews section, tap the Clear button in the upper left-hand corner of the screen. This button will clear all items from the Previews section at once. The process of redeeming and sending gift cards is exactly the same as it is on the App Store app. 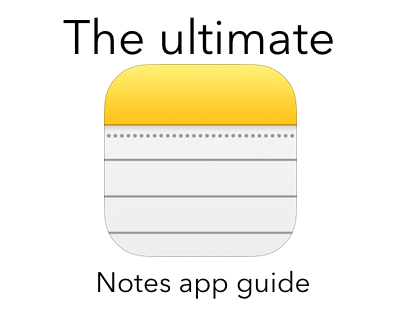 For that reason, we encourage you to view those respective sections in our Ultimate App Store guide. Like the stock Music app, the bottom of the iTunes Store app features several tabs for accessing differing types of information. At all times, you will find five tabs at the bottom of the interface. These consist of four customizable tabs, followed by a More tab. The More tab is the tab that you’ll need when you want to access the whole gamut of what the iTunes Store app has to offer. 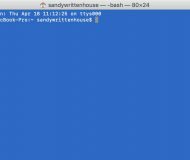 It’s a way to access the tabs that haven’t been privileged with access to the bottom of the interface. Tapping the More tab opens the More page, which contains five additional tabs. These tabs will differ depending on how you’ve chosen to configure the tabs that already appear at the iTunes Store app interface. By tapping the Edit button that resides in the upper right-hand corner of the screen, you’ll gain access to rearrange any of the nine tabs present. Drag the icons to the bottom of the interface while while in edit mode to organize any of the nine available tabs. Once you’ve finished rearranging the tabs, tap the Done button in the upper right-hand corner to exit edit mode. 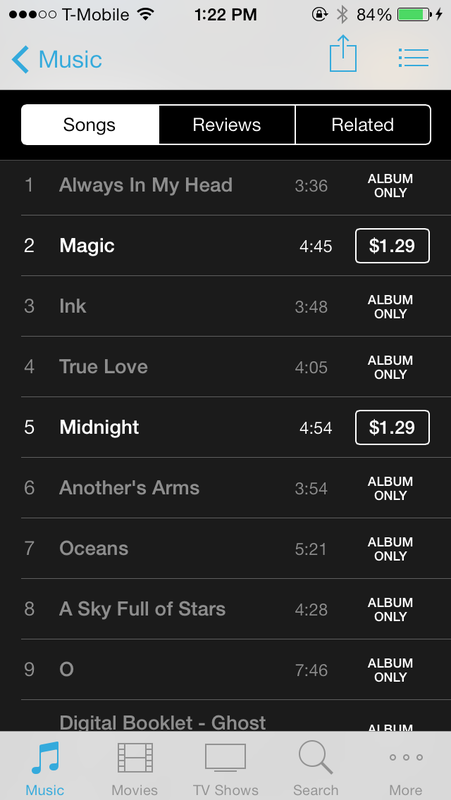 Most songs found on the iTunes Store start at $1.29, but songs can be purchased for as cheap as $0.69 if on sale. Album prices also vary considerably. 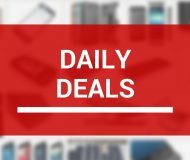 Many new albums are available for $9.99, even if individual songs are priced at $1.29 and feature more than eight songs. Generally speaking, full albums provide a better “bang for your buck” than buying individual tracks. All of the music sold on iTunes uses the AAC codec at 256kbps. Many new albums are now ‘Mastered for iTunes’, which basically means that music is encoded to sound good even at lower bit-rates. For more information on ‘Mastered for iTunes’ albums, check out this link. One of the unique things about music in the iTunes Store app is that it can be previewed while you peruse the rest of the iTunes Store interface. Once you begin playing a preview, you can switch tabs and still see the preview of the song, including its progression, a stop button, and a button for purchasing the song. Most of the albums contained within iTunes that features explicit lyrics are marked with a red ‘E’ to signify such. Most explicit albums available on iTunes feature “clean” versions that can be accessed via the Related tab on its single item view. 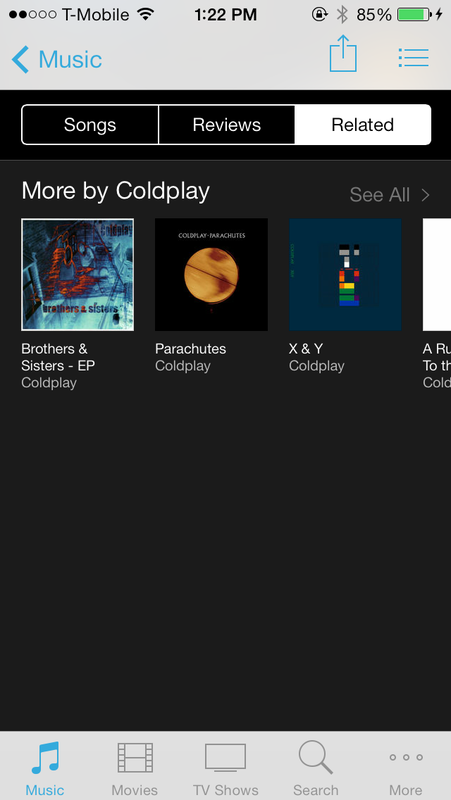 Amongst all of the other albums, singles, and featured sections found in the Music tab, is the iTunes Radio section. Tapping any of the items found under the iTunes Radio section will cause the stock Music app to open and begin playing that station. Generally speaking, movies range between $9.99 and $19.99. Sometimes Apple runs amazing deals that allow you to pick up bundles of movies for one low price. For example, three movies that normal retail for $14.99 a piece might be sold for $9.99 collectively. That’s a savings of almost $35. Standard definition movies are generally cheaper than their HD counterparts, but not necessarily. Usually, you can find the standard definition version cheaper by $2-5 dollars. Sometimes, Apple will allow you to rent movies instead of buying them. In rarer cases, you’ll find movies that are only available to rent and not available for purchase. This is largely based on deals that have established with movie studios, so not all movies are available to rent. 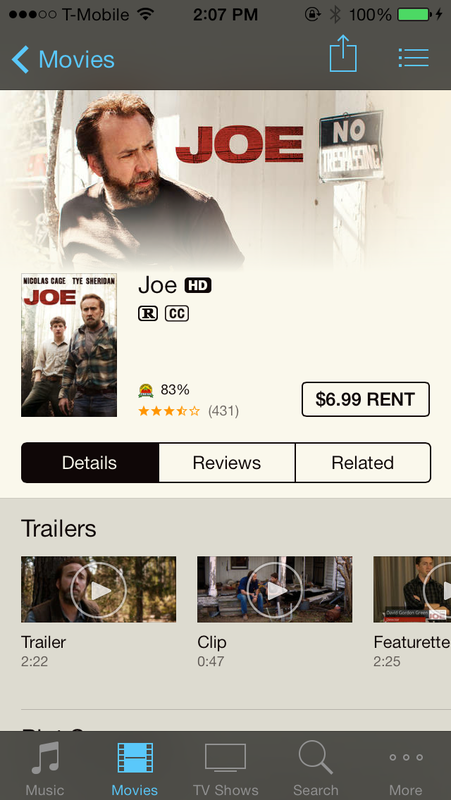 If a movie is available to rent, you’ll see a Rent button underneath the Buy button on the movie’s single item view. Rentals are always cheaper than buying a movie, but you only get temporary access to rented movies, whereas you get lifetime access to movies that are purchased. Rented movies have a 30-day shelf life, assuming that you haven’t begun watching the movie. Once you start watching a rented movie, you have 24 hours (US) to complete the viewing. If you live somewhere besides the United States, the watch period is extended to 48 hours. Rented movies can be watched as many times as desired within the window periods. Most new movies are available in high definition (720p or 1080p), but you have the option to watch purchasable and rental movies movies in standard definition as well. Standard definition movies are usually cheaper (though, not always) and download faster due to the smaller file size. High definition movies feature an ‘HD’ logo next to the title of the film. You can switch between HD and SD versions of a film by scrolling to the bottom of the single item view’s Detail tab, and tapping the “Also Available in…” button. 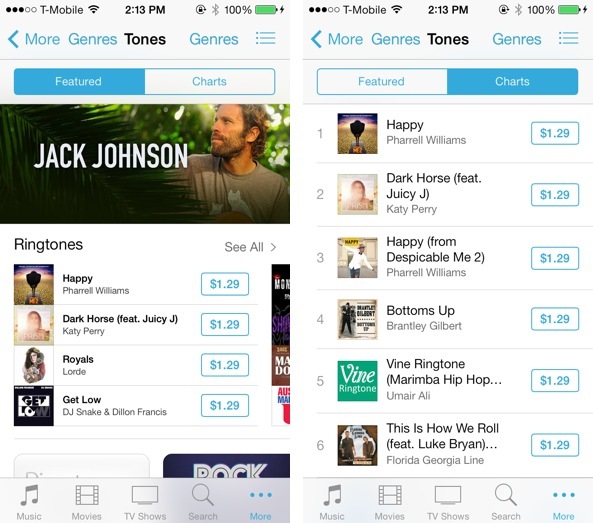 If you want a quick and easy way to add ringtones to your iPhone, then the Tones section of the iTunes Store is the section for you. While the ringtones available on the store are severely overpriced in our opinion, it’s hard to argue with the sheer convenience of simply downloading a ringtone and using it immediately. Like the Music tab, you can preview ringtones found in the Tones tab and they are of the persistent variety. This means that you can preview a ringtone and browse the rest of the iTunes Store interface while still being able to stop or purchase that ringtone at any given time. Once purchased and downloaded, you can assign your ringtone directly to a contact or make it your generic ringtone for your entire device. Single episodes usually run at $2.99 for high definition downloads and $1.99 for standard definition. While the prices of individual shows are much less pricey than individual movies, a collective season of a TV show can be fairly expensive. Like movies, TV shows come in SD and HD versions. The HD versions are usually more expensive than their SD counterparts by about a buck. The Season Pass feature is exclusive to TV shows found in the iTunes Store. Season Pass allows you to purchase an entire season of a show before all of the season’s episodes have been released. It’s sort of like pre-ordering a full season, which means you don’t have to worry about purchasing each episode individually as it arrives on iTunes. Season Passes often come at some sort of monetary discount, and at times, include bonus content. Season Passes are only available for TV shows that are currently running on broadcast TV. Shows that have finished airing can be purchased as a full season, which is different than a Season Pass. When new Season Pass episodes arrive, you’ll be sent an email alerting you of the episode’s availability. A Season Pass includes all current and future episodes of a particular show’s season. Current episodes will download immediately after purchasing Season Pass, and future episodes will download when you sign in to iTunes on your device. Breaking the mold of every other form of media available in the iTunes Store, audiobooks are priced with a five cent ending value instead of a 9 cent ending value i.e. $9.95 vs $9.99. Prices of Audiobooks vary greatly. I’ve seen some as low at 5.95, and some closer to the $30 range. Unlike the previews available for Music and Tones, the previews available in the Audiobooks tab are good old fashioned HTML embeds. 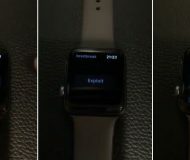 Each preview is about 90 seconds in length. The search result page features a filter near the bottom of the search box for filtering the type of media that is displayed. You can select the All section to display all of the forms of media, or you can choose the Songs, Albums, or More section to filter the search results. The one media type that’s noticeably missing is apps. Apps can only be searched and downloaded via the App Store app. 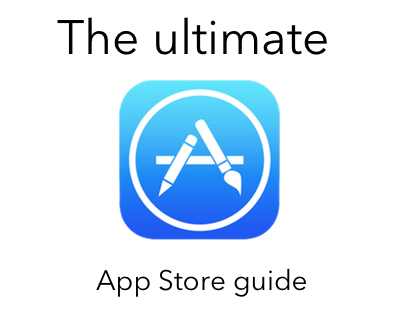 With that in mind, be sure to view our Ultimate App Store guide for more information on downloading apps. You can use the Genius tab to find additional media that may appeal to you. Genius results are similar to those that you’ll find when using the Music app. The Genius algorithm is able to find Music, Movies, and TV Shows that you may like based on your other content and purchased items. Music is broken up into songs and albums. Movies and TV Shows are just a list of movies that Genius thinks you might like. Genius allows you to swipe to rate the movie and TV show picks to help further curate its selections. You can break Genius suggestions down further by using the Genres button in the upper right-hand corner of the page. Genius will only return Genres that it thinks you might be interested in, so the list won’t be the exhaustive list that you’d find in other tabs. The Purchased tab contains a list of all the the purchases that you’ve made on the iTunes Store, regardless of the device that you purchased them on. Purchases are directly tied to an Apple ID, so you’ll find items that you’ve purchased on other devices listed here. Purchases are broken up into individual types of media. For example, the Music section in the Purchased tab only pertains to songs and albums that have been purchased. The Music section is further broken up into recent purchases, all songs, and an alphabetical list of all music items based on artist name. At the top of the music section of the Purchased tab are two buttons for further filtering the music items. The All button displays all purchases, and the “Not on this…” button displays only items that have not been downloaded to the device you’re currently using. Any item that you’ve previously purchased can be re-downloaded as many times as you’d like. When you find an item that you wish to download, tap the download/cloud button to start the download process. Once you do, you’ll notice a red badge on the More tab that resides in the bottom right-hand corner of the interface. This badge pertains to the Downloads tab, which we will now discuss. Once you start a download via the Purchased tab, or via an outright new purchase on the iTunes Store, your downloads will be listed, queued, and downloaded via the Downloads tab in the iTunes Store app. The iTunes Store app’s Download tab is also where Music App downloads are listed once they are initiated. This is a good thing to remember, because sometimes when downloading music from the stock Music app, it’s difficult to tell why a download is taking a long time to complete. By venturing into the Downloads tab of the iTunes Store app, we can better diagnose our downloads from the stock Music app. Once a download has begun, you’ll see it listed in the Downloads tab, usually with the artwork of the pending download, its name, and download status. You’ll find a pause button on the right-hand side of a pending download that can be used to pause a download. You can also swipe from right to left on a download to delete a download. In the upper right-hand corner of the Download tab, you’ll find a Purchased button, which, one would think, would lead back to the Purchased tab in the iTunes Store app. Not so. The Purchased tab links to a Purchased playlist in the stock Music app, that may or may not exist. It’s the weirdest thing, and I don’t see why Apple decided to map this button to the stock Music app, no less to a playlist that can be easily removed by the user. 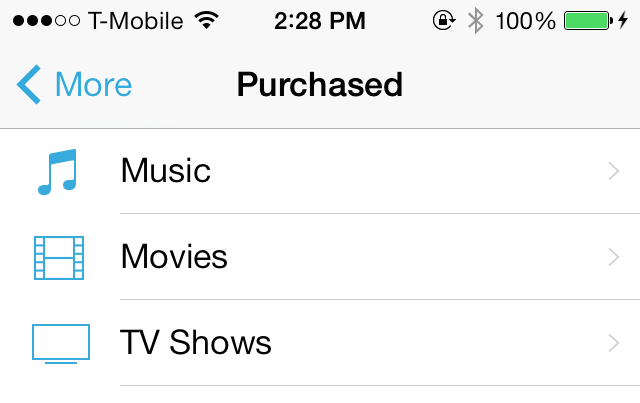 There are many settings directly related to the iTunes Store app in the stock Settings app, but there are a couple. To find the settings for the iTunes Store, go to Settings > iTunes & App Store. At the top of the iTunes & App Store preferences, you’ll find a section for entering in your Apple ID. This is the Apple ID that will be associated with all iTunes Store purchases. It’s also the Apple ID that you should use for the account that contains previous purchases that you want to re-download. You can enable automatic downloads for music purchases made on other devices. 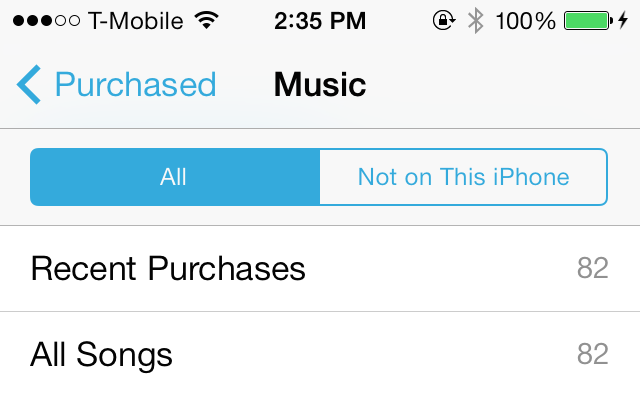 Music app purchases will automatically download on the device where this toggle is enabled. 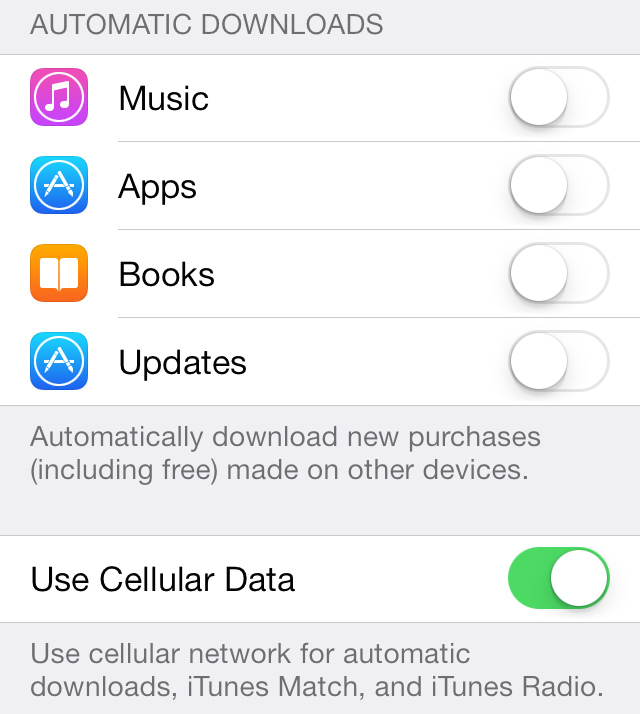 You can use the Use Cellular Data toggle beneath it to enable automatic downloads via cellular data as well. Just beware, music downloads can be bandwidth intensive and quickly eat through any data restrictions you might have. The iTunes Store is an app stuffed to the brim with content. It’s an exhaustive collection of some of the best media available. iTunes is the digital entertainment hub, and it’s one of the reasons that people stay locked into the Apple ecosystem. The iTunes Store is about so much more than just Music. It’s about combining all of your favorite digital entertainment forms into one easy to consume marketplace. What do you think about the iTunes Store? Are you currently locked into the Apple ecosystem? Is there anything that we missed that you feel is worth including in this guide? Sound off down below in the comments section and let us know what you think.